As you can see below, the Orkney Woodland Project came to an end in 2013, but with the arrival of new grants, there is again an interest in tree planting in Orkney. The Forestry Commission are keen to have their Northern and Western Isles grant taken up and the Woodland Trust are funding me (Jenny Tayor), under their Croft Forestry initiative, to give free advice and draw up proposals for new projects that may arise in the County. After almost 15 years, the Orkney Woodland Project is finally drawing to a close and I would just like to say that it has been an absolute pleasure to work with all the people, from farmers to school children, who have so enthusiastically planted trees throughout the islands. Thank you all for making my job so very enjoyable! For those of you interested, the facts and figures are as follows - 228 folk have obtained and taken up grants through the work of the project and, as a result, a total of 127 hectares of new woodland has been created or brought into management. At a very rough estimate, at least 5000 people have been advised by the project, with many planting trees without grants. 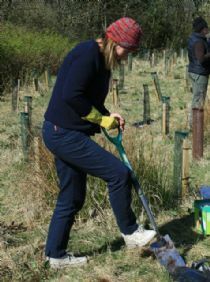 Recent Woodland Trust funding has also allowed me to provide suitable trees for numerous school and community projects. This website will be further developed with some more, hopefully useful, information. In the meantime, I am still available to do any woodland consultancy work in the County.